Looking for a last-minute Easter dessert? You can make this Easter egg cake with no fuss in less than two hours. You don't need any special pans, and the recipe calls for just a few simple ingredients. It will be a stunner on your Easter table, and can double as a decorative centerpiece. 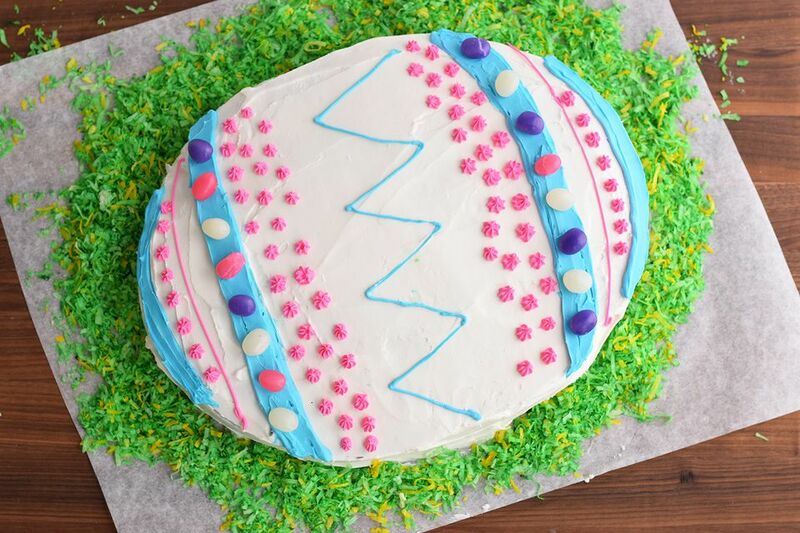 Get creative with decorating your egg cake! You can use edible grass available seasonally in candy and specialty baking stores, or make your own with shredded coconut and a drop or two of green food coloring. Decorate the finished cake with colored frosting and your favorite Easter candy for a memorable holiday dessert you'll make again and again. Cream the butter and sugar together in the bowl of a stand mixer or a large mixing bowl with a hand mixer, about 10 minutes, until light and fluffy. Beat in the eggs one at a time, until creamy and totally incorporated. Whisk together the remaining dry ingredients in a large bowl. You can also sift the ingredients together. Alternate adding the dry mixture and the milk into the sugar and butter mixture, beating after each addition. Scrape down the sides of the bowl, and mix until all ingredients are completely incorporated, with no remaining lumps. You'll need a square baking pan and a round, 9-inch baking pan. Prepare your cake pans by spraying them with cooking spray, then coating them with flour. You can also place a piece of parchment paper in the bottoms of the pans. Divide the cake batter evenly between the prepared pans. Bake them in a 375 F degree oven for 40 minutes, or until a toothpick comes clean out of the center of the cakes. Allow the cakes to cool, then remove them from the baking pans. Cut off a half-circle from each of the ends of the cake. You are not cutting the cake in half, just slicing the ends off. You can cut one bigger than the other, so that the egg looks like one end is larger than the other (as it does in real life). Place the half circles onto the ends of the square cake. Cut some of the middle of the round cake into strips to lay on the sides of the square cake. Trim the strips so that they are rounded appropriately. Fill in the cracks of the cake with some frosting. You can also use toothpicks to fasten the cake pieces together. Cover the cake with a crumb coating of frosting. Apply the final coating of frosting. Place the cake in the refrigerator for a few minutes to allow the frosting to set, then apply the colored frosting using a piping bag. You can now add add jelly beans or other decorations. Decorate the edges of the egg with green-tinted coconut to look like grass.